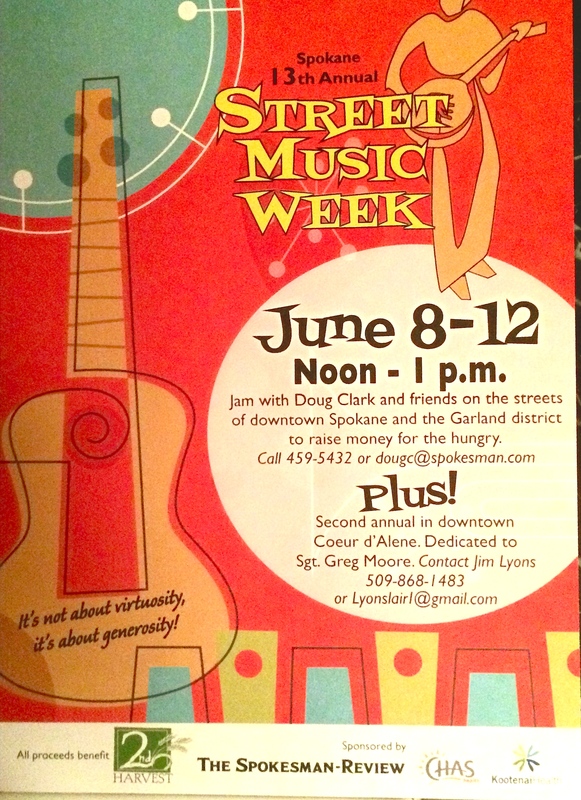 Thu., May 21, 2015, 8:21 p.m.
We are closing on Spokane Street Music Week, the lucky 13th annual. Downtown Spokane, our original location. The Historic Garland District in North Spokane. Those coming downtown can check in with me prior to noon outside Starbucks on Main, across from Pottery Barn. The Gathering Place (kitty corner from the Milk Bottle) is the check-in location for Garland and the Spirit Art Gallery on Sherman is the place for Coeur d’Alene. Harvest food and this year we should pass that magic $100K figure. Step One – meet me prior to noon at the aforementioned locations. Step Two – Sign in with name, cell number and email address if we don’t have it in our database. Step Three – You’ll receive a participation badge (that you can keep) and a red plastic collection bucket. Step Four – Go find a sidewalk location to perform. Just don’t block any doorways for impede the pedestrian traffic. Step Five – At 1 p.m., bring the bucket (with any collected money in it) back to your check-in spot. Remember that every cent goes to 2nd Harvest food bank. Step Six – You can participate one day or every day – it’s entirely up to you, although we always side on the more the merrier. Posted May 21, 2015, 8:21 p.m.